Osteoarthritis is a common ailment that can have a major impact on daily living. It can make it difficult to do simple things like walking, climbing stairs, or even playing with children or grandchildren. It often causes pain that prevents sufferers from doing the things they love, and in severe cases, it can make independent living a challenge. While there is no cure for OA, there are treatments that can help. If you or a loved one is living with osteoarthritis, here are a few ways that physical therapy can help. Osteoarthritis often causes pain and range of motion restrictions that result in weakness in the surrounding muscles. The more your joints hurt and the more difficult they are to move, the less you will use the surrounding muscles. This, obviously, leads to weakness. Your physical therapist can help you build strength by guiding you through targeted strength-building exercises. Strengthening the surrounding muscle helps to stabilize the joint and can improve your endurance. Osteoarthritis affects joints as well as the capsule and ligaments surrounding the joint. It often leads to decreased range of motion and prevents the body from moving properly. Your physical therapist will teach you how to stretch the appropriate structures to reduce pain and increase range of motion. Your therapist will also perform various techniques to address joint stiffness. When it comes to movement, physical therapists are experts. They view the body as a whole rather than focusing on separate parts that need to be treated individually. Your therapist may see that abnormal movements, like poor lifting form or poor posture, is contributing to your pain. By addressing these issues and restoring proper movement to your body, it may be possible to alleviate some of the effects of osteoarthritis. By seeking treatment for your osteoarthritis, you can get back to doing the things you love. 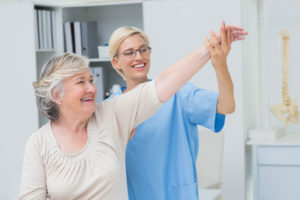 At Denver Physical Medicine, we perform physical therapy for osteoarthritis, and we can create a customized treatment plan that will help you meet your goals. To learn more, please contact us today.